To maximize opportunities for EmblemHealth, we are restructuring the Sales and Client Management organizations into distinct Commercial and Labor business segments. In this new structure, Sales and Client management will be integrated into a single unit for each segment. David Notari and George Babitsch will oversee the Commercial and Labor segments, respectively. 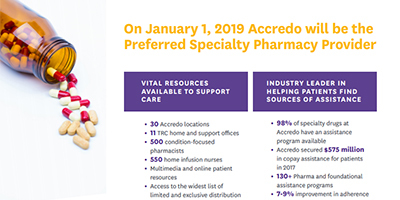 We are happy to announce that Accredo is now EmblemHealth’s new preferred specialty pharmacy. Accredo has offered specialty medicines, personalized care, and support services since 1996. It is part of Express Scripts. 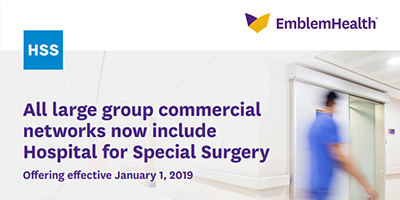 EmblemHealth is proud to announce that as of this month, we’ve added one of the best specialty hospitals in the country to our large group commercial network. Hospital for Special Surgery (HSS) is ranked the number one orthopedic hospital in the United States by U.S. News & World Report, and number three in rheumatology. It’s also one of the best children’s hospitals for orthopedics. 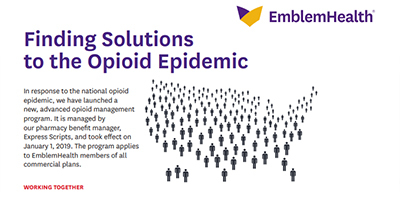 In response to the national opioid epidemic, EmblemHealth will launch a new, advanced opioid management program (link to PDF) engaging pharmacies, prescribing health care providers, and members. This program, managed by our pharmacy benefit manager, Express Scripts, took effect Jan. 1, 2019. It applies to all of EmblemHealth’s commercial plan members. 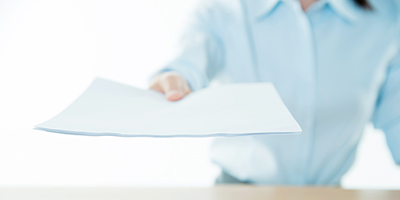 EmblemHealth will host a series of broker seminars beginning next month. These classes will focus on education and innovative solutions. The first webinar will be about our telemedicine through Teledoc benefit. Stay tuned for details.